Logic gate basics and a detailed look at practical TTL and CMOS digital buffer IC circuits in this first part of a five-part mini series. The functional action of any logic gate can be described either in words or in a tabular or symbolic way. 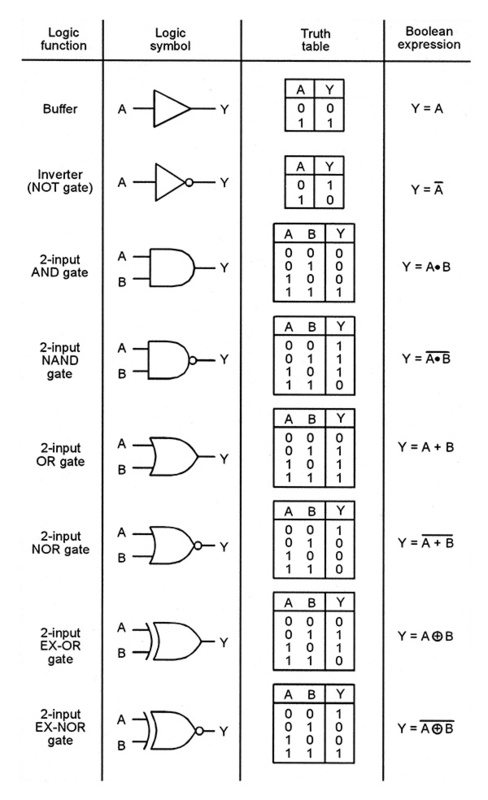 The following list describes the functions of all eight basic types of logic gates in words. 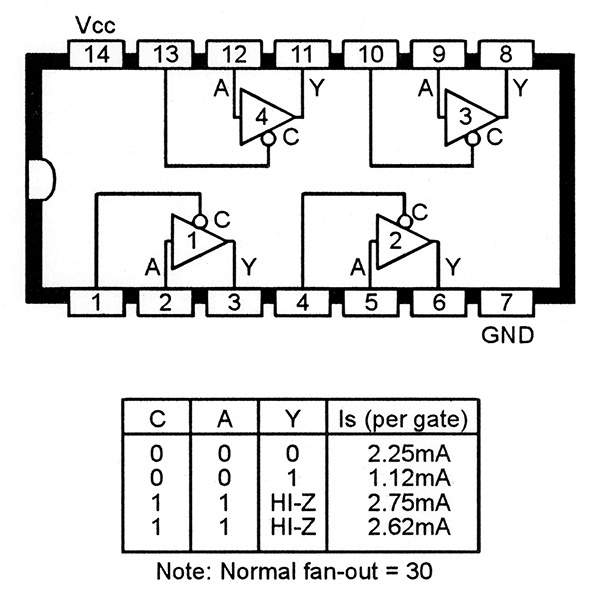 Buffers — A buffer is a non-inverting amplifier that has an output drive capacity that is far greater than its input drive requirement, i.e., it has a high fan-out and gives a logic 1 output for a logic 1 input, etc. Inverters — An inverter (also known as a NOT gate) is a high fan-out amplifier that gives a logic 1 output for a logic 0 input, and vice versa. 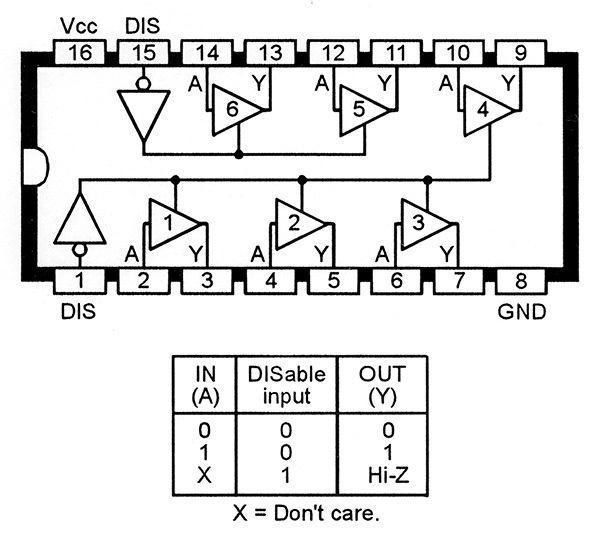 AND Gates — An AND gate has an output that is normally at logic 0 and only goes to logic 1 when all inputs are at logic 1, i.e., when inputs A and B and C, etc., are high. 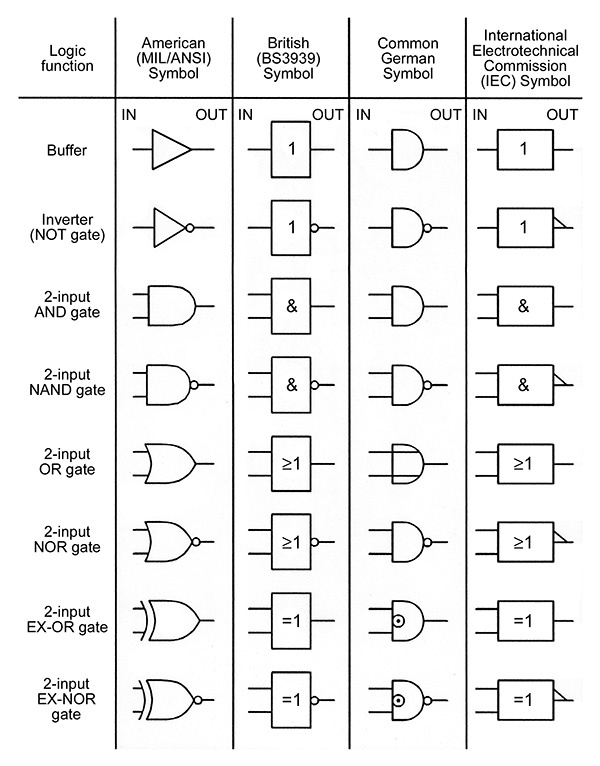 NAND Gates — A NAND gate is an AND gate with a negated (inverted) output; the output is normally at logic 1 and only goes to logic 0 when all inputs are at logic 1. OR Gates — An OR gate has an output that goes to logic 1 if any input is at logic 1, i.e., if inputs A or B or C, etc., are high. The output goes to logic 0 only if all inputs are at logic 0. 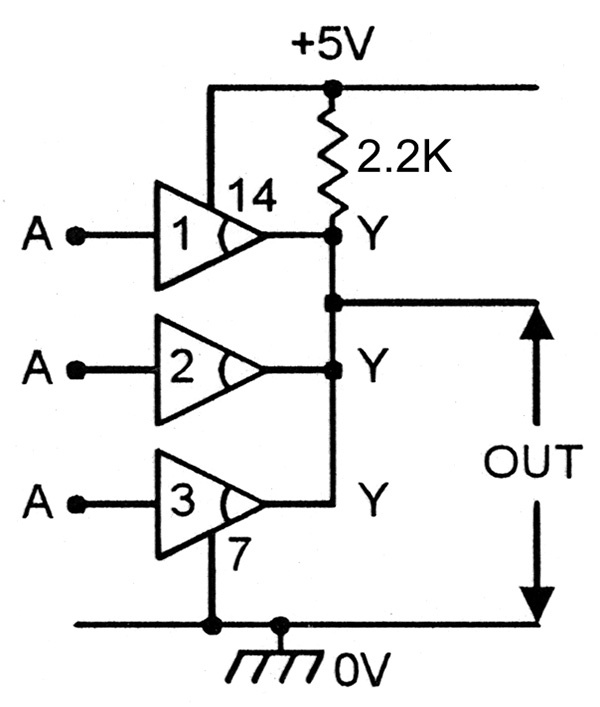 NOR Gates — A NOR gate is an OR gate with a negated output; it has an output that goes to logic 0 if any input is at logic 1, and goes to logic 1 only when all inputs are at logic 0. 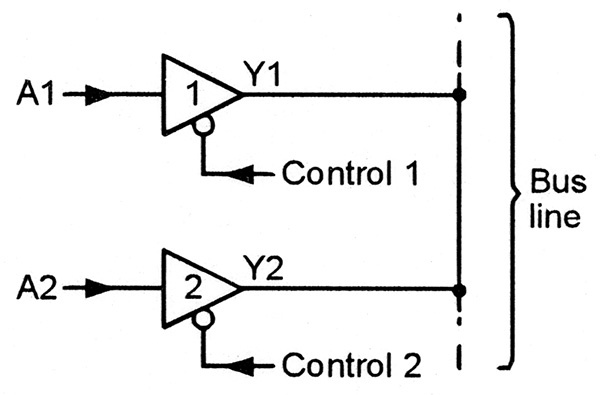 XOR Gates — An exclusive-OR (EX-OR) gate has two inputs, and its output goes to logic 1 only if a single input (A or B) is at logic 1; the output goes to logic 0 if both inputs are in the same logic state. XNOR Gates — An exclusive-NOR (EX-NOR) gate is an EX-OR gate with a negated output, which goes to logic 1 if both inputs are in the same logic state, and goes to logic 0 only if a single input is at logic 1. Figure 3 shows how the functions of the eight basic types of gates can also be presented in tabular form via truth tables (which show the logic state of the output at all possible input logic state combinations) or symbolically via Boolean algebraic terms. Note that, by convention, all logic gate inputs are notated alphabetically as A, B, C, etc., and the output terminal is notated as Y (in counters and flip-flops, etc., the main output is usually notated as Q). The actual logic states may be represented by 0 and 1, as shown, or by L (= Low logic level) and H (= High logic level). Also note in the Boolean expressions that a negated output is indicated by a negation bar drawn above the basic output symbol; the negated state is called a not state; thus, a negated Y output is called a not-Y output. 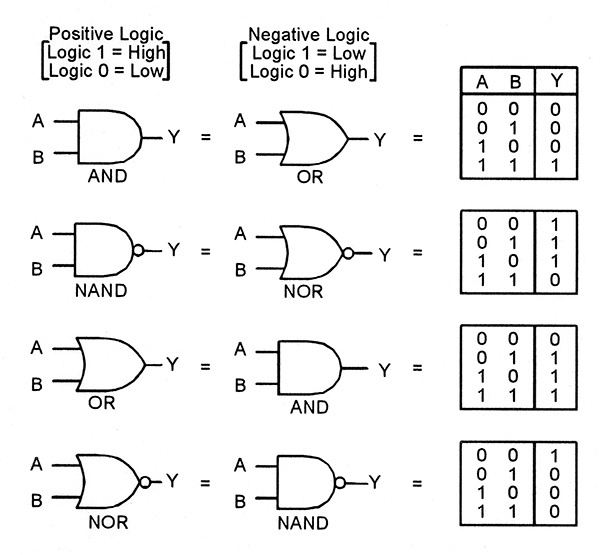 All modern digital logic circuitry assumes the use of the positive logic convention, in which a logic 1 state is high and a logic 0 state is low. 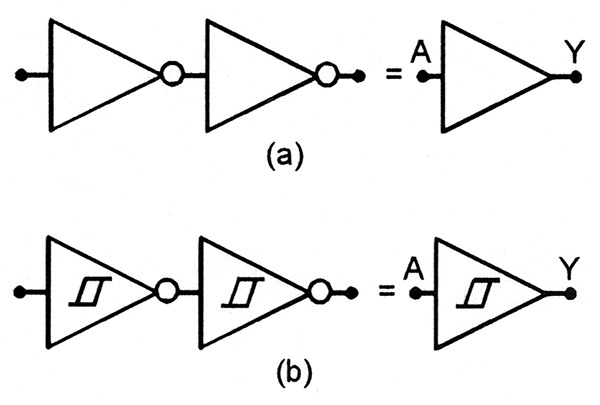 In the early days of electronic digital circuitry, an alternative ‘negative logic’ convention — in which a logic 1 state is low and a logic 0 state is high — was also in common use, and it is sometimes still useful to be able to think in negative logic terms, particularly when designing gates in which a low state output is of special interest. With this point in mind, Figure 4 presents a basic set of two-input positive and negative logic equivalents. Thus, it can be seen that a negative logic AND gate action — in which the output is low only when both inputs are low — is directly available from a positive logic OR gate, and so on. FIGURE 6. Any two elements from an inverter IC can be used to make a non-inverting buffer element. FIGURE 7. 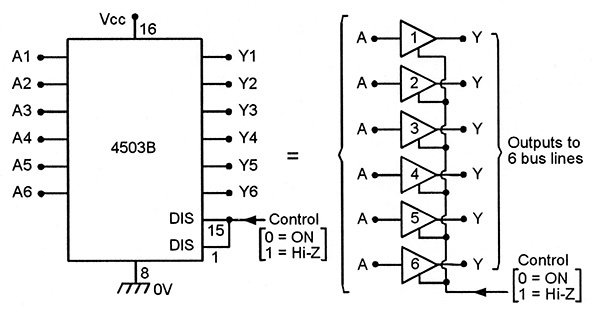 Nine popular non-inverting buffer ICs. 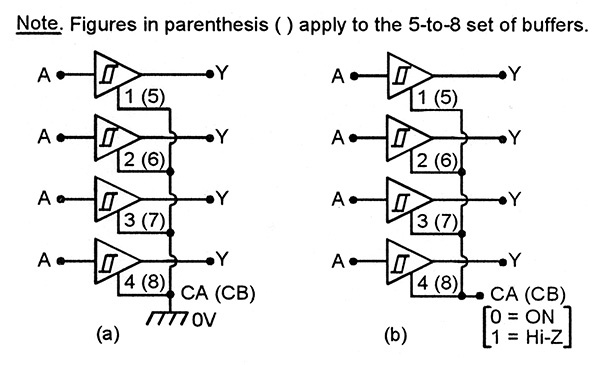 Figure 7 lists basic details of nine popular, non-inverting digital buffer ICs. When using these ICs, note that all unused buffers must be disabled by tying their inputs to one of the IC’s supply lines. In CMOS devices, the unused inputs can be tied directly to either supply line, but in TTL devices, it is best (for lowest quiescent current consumption) to tie all unused inputs high via a common 10K resistor. If the unused buffer is a three-state type, it should (if it has independent control) be set into its normal mode via its control input. Dealing now with the individual buffer ICs listed in Figure 7, Figure 8 shows the functional diagram and truth table, etc., of the 74LS125 TTL IC, which houses four independently controlled, three-state buffers and is so modestly priced that it is still worth using, even if you do not need the three-state facility. Note from the truth table that each of the four elements acts as a normal buffer when its control terminal (C) is in the logic 0 state, and that the element’s quiescent current (Is) is least when C is at logic 0 and the buffer’s input (A) is at logic 1. FIGURE 9. All unwanted 74LS125 elements must be connected in one of these ways. FIGURE 10. Methods of using a 74LS125 element as a normal buffer. Thus, any unwanted elements should be disabled by tying their C terminals low and their A terminals high, using one of the methods shown in Figure 9. Any element can be used as a normal buffer by grounding its C terminal (Figure 10), or as a three-state buffer that drives a common bus line by using it as shown in Figure 11. FIGURE 11. Methods of using a 74LS125 element as a three-state line-driving buffer. FIGURE 12. Functional diagram of the 4050B or 74HC4050 Hex buffer IC. 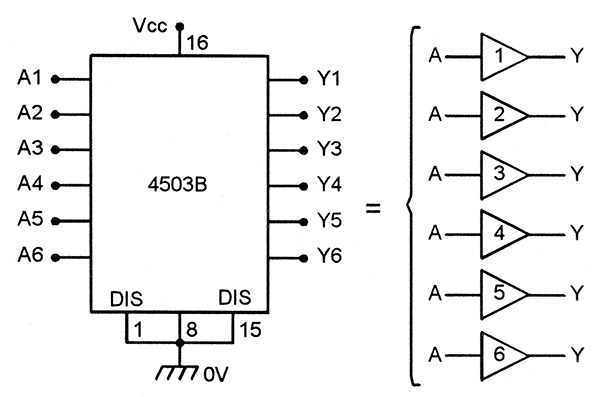 If you need up to six three-state CMOS buffers, one option is to use a 4503B Hex buffer IC. 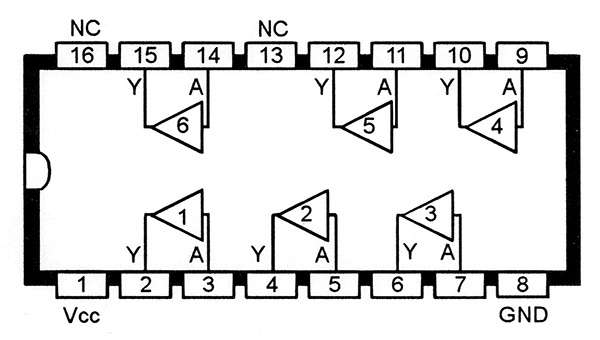 Figure 13 shows the functional diagram and truth table of this versatile IC, in which pin 1 acts as a DISABLE input that controls four of the six buffers, and pin 15 acts as a DISABLE input that controls the other two buffers. Note that each buffer element acts as a normal buffer when its DISABLE pin is at logic 0 (low), and goes into the high-impedance output state when its DISABLE pin is at logic 1 (high). FIGURE 14. 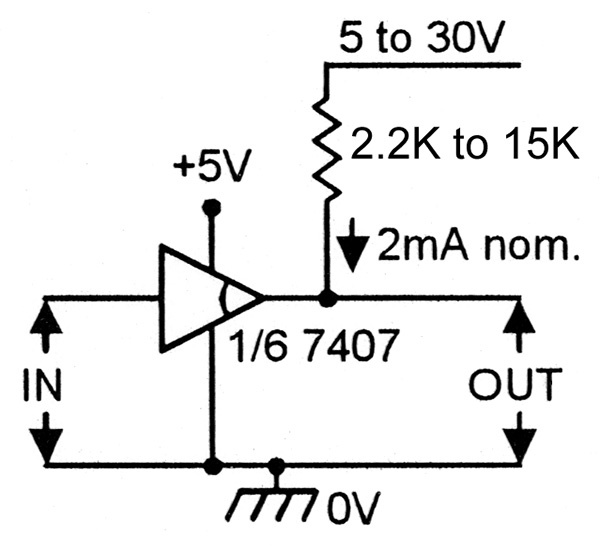 Method of connecting the 4503B for use as six normal buffers. FIGURE 15. Method of connecting the 4503B for use as a three-state Hex buffer controlled via a single input. FIGURE 16. 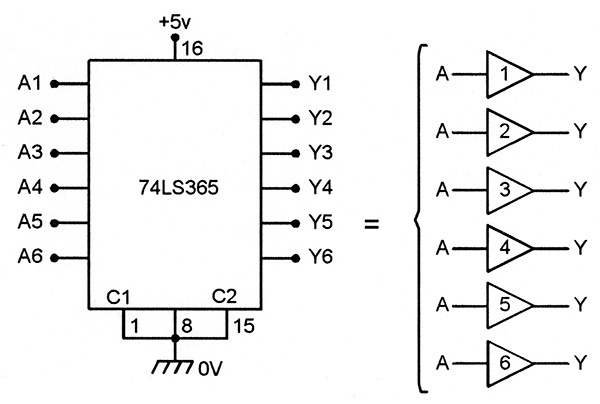 Functional diagram of the 7407 Hex buffer with 30V o.c. outputs. FIGURE 17. 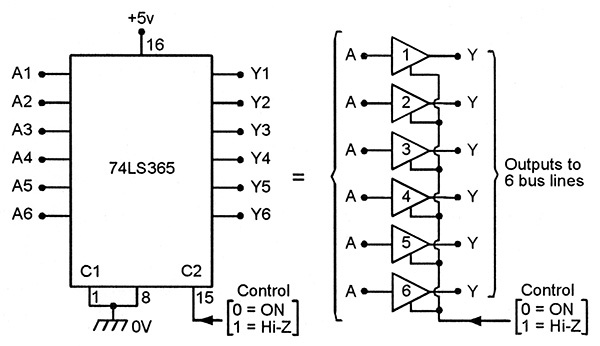 A 5V to high-voltage buffer/interface. FIGURE 18. Three 7407 buffers used to make a three-input wired AND gate. Figure 16 shows the functional diagram of the 7407, which is a standard TTL Hex buffer in which each buffer has an open-collector output that can sink up to 40 mA and can be connected to a supply of up to 30V via an external current-limiting pull-up resistor (but the actual IC must use a 5V supply). Figure 17 shows how one of these buffers can be used as a 5V to high-voltage (up to 30V) non-inverting interface. Figure 18 shows how three o.c. buffers can be made to act as a wired AND gate by wiring all three outputs to the same pull-up resistor. The circuit action is such that the output is pulled low when any input is low, and only goes high when all three inputs are high, thus giving an AND action. FIGURE 20. Methods of connecting the 74LS365 for use as six normal buffers. FIGURE 21. Methods of connecting the 74LS365 for use as a three-state Hex buffer controlled via a single input. FIGURE 22. 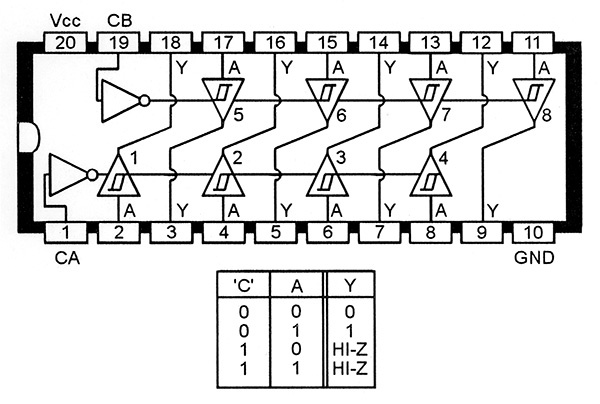 Functional diagram and truth table of the 74LS244 (or 74HC244) Octal (dual Quad) three-state Schmitt buffer IC. FIGURE 23. 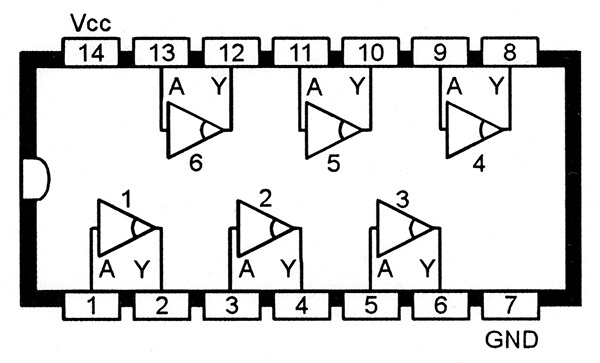 The 74LS244 Quad buffers can be used as (a) simple Schmitt buffers, or as (b) three-state ganged Schmitt buffers.